What Is The Emoluments Clause And How Does It Apply To Donald Trump? WASHINGTON When the Constitutional Convention convened in Philadelphia to debate and write a new constitution for the United States, there was a concerted effort to ensure that the new nation would break from the corrupt practices of the Old World. European kings and princes bestowed gifts and payments to diplomats, dignitaries and politicians in their own legislatures and in foreign states. To the new Americans, these gifts and payments could corrupt the new nation’s sovereignty. They had already thrown off control by the British crown, and many questioned the growing relationship with their new ally, France. Some U.S. generals during the revolution were found to have accepted payment from these foreign states. Those debating the Constitution did not want to divorce themselves from the politics of Europe, but they also wanted to insulate the new government from these inducements to corruptions. 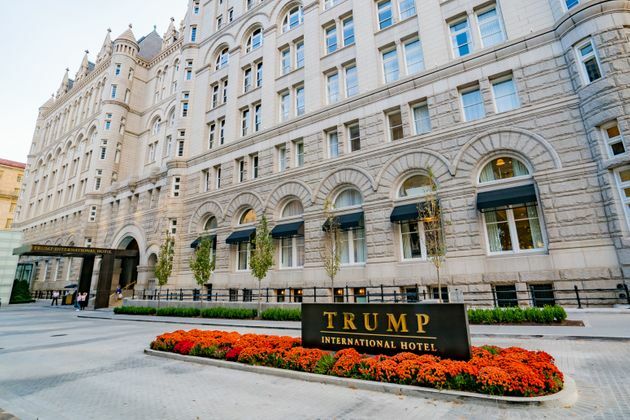 The election of billionaire real estate mogul Donald Trump to the presidency has suddenly swung the Emoluments Clause out of the “odd clauses” closet and into the center of political controversy. Ethics experts and constitutional law scholars have raised the specter that the president of the United States will be in direct violation of the Constitution on the day he takes office, with his many business deals in foreign countries, a hotel soon to be frequented by foreign dignitaries and hundreds of millions in debt to the government-owned Bank of China. The Trump International Hotel in Washington, D.C., has already pitched foreign dignitaries on staying at the hotel to curry favor with the president-elect. While there is some scholarly debate over whether the Emoluments Clause does apply to the president, for most of American history U.S. presidents have acted as though it has. The Congressional Research Service says that the clause is one of a handful of ethics statutes that “potentially” apply to the president. The Department of Justice’s Office of Legal Counsel has routinely ruled on whether the president and other lower officers could receive certain gifts, titles or emoluments (this basically just means payments) under the clause. The record also goes back before the existence of the Office of Legal Counsel and the Department of Justice. These past rulings and actions show a record of government lawyers and past presidents applying the clause to the presidency for close to 200 years. A 2009 OLC opinion that determined President Barack Obama could accept the monetary award that came with the Nobel Peace Prize stated rather clearly that the president “surely” holds an office that would fall under the Emoluments Clause. A past opinion on the government of Ireland’s bestowal of Irish citizenship on President John Kennedy presumed the clause applied to the presidency as well. President Andrew Jackson was a recipient of a gold medal given by the Latin American revolutionary turned Colombian president Simon Bolivar. Under the belief that he could not accept such a gift without the consent of Congress, Jackson asked for their advice on whether he could keep it. Congress determined that he could not. In 1840, merchants sailing from the Middle East informed President Martin Van Buren that they carried with them many gifts for him from the imam of Muscat (present-day Oman). The imam had sent two Arabian horses, rose oil and rose water, cashmere shawls, a Persian rug and a sword for the president. Van Buren was under the assumption that the Emoluments Clause forbade these gifts, but he also did not want to insult the imam and send them back with the merchants. He asked Congress if the gifts could be sold and the proceeds deposited into the Treasury. They voted to allow this. This same gift sale repeated itself when the imam sent the president two more horses in 1843. Congress eventually ruled in 1845 that the horses could be sold and the profit given to the Treasury. 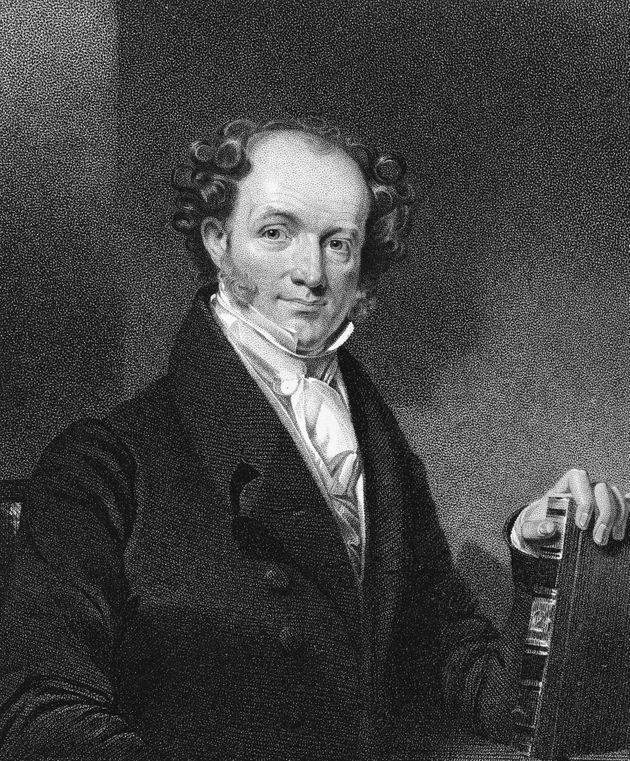 Martin Van Buren, the eighthpresident of the United States,received gifts from a foreign dignitary that he believed he could not receive due to the Emoluments Clause. There is one person who seemed to think that the clause did not apply to him. President George Washington received gifts from both the French ambassador to the United States and from the Marquis de Lafayette. The latter sent Washington the key to the Bastille after its storming during the early days of the French Revolution. This occurred when Lafayette was a member of the Estates-General and commander in chief of the national guard. Where precedent points toward the clause applying to the president, a further dispute arises over whether it simply covers gifts or other payments. “In my view, having studied the Emoluments Clause ever since 1978, it’s always been clear to me that its language is deliberately very broad, that it covers any kind of payment, not just a gratuity or a gift, but an ordinary payment to a profit-making enterprise,” Tribe said. Norm Eisen, the former top ethics advisor to Obama and former ambassador to the Czech Republic, notes that there is some dispute as to whether the payment must be favorable or any fair market payment. The nature of Trump’s business enterprise, however, makes it very difficult to determine whether the business successes he has during his administration are won fair and square. When a foreign government green-lights permits for a new Trump-named building, or if he or his business partners are granted tax breaks from those governments, it will be impossible to know whether he received those because of his government position. The same goes for the business that foreign governments are already directing to the Trump International Hotel in Washington, D.C. Would these governments rent out event space or luxury rooms if he were not the president? One area that is rather unprecedented is that these payments would be going to a corporation and would eventually materialize as profit for Trump. The key here is that the Trump Organization is a privately held corporation and is, in essence, an extension of Trump. If it were a publicly held corporation these questions would probably not arise, although potential conflicts of interest could still certainly exist, as they did for former New York City Mayor Michael Bloomberg. As for whether the Emoluments Clause applies to payments to a corporation that distributes profit to the government official in question, there is at least one OLC opinion that presents some kind of answer. In 1993, members of the Administrative Conference of the United States, an agency that includes unpaid private citizens advising the government on administrative procedure law, asked whether the receipt of payment from partnership earnings at a law firm that held foreign governments as paying clients would be a violation of the clause even if the recipient did not work with the foreign government client. The opinion ruled that this payment through partnership earnings would indeed be prohibited under the clause. 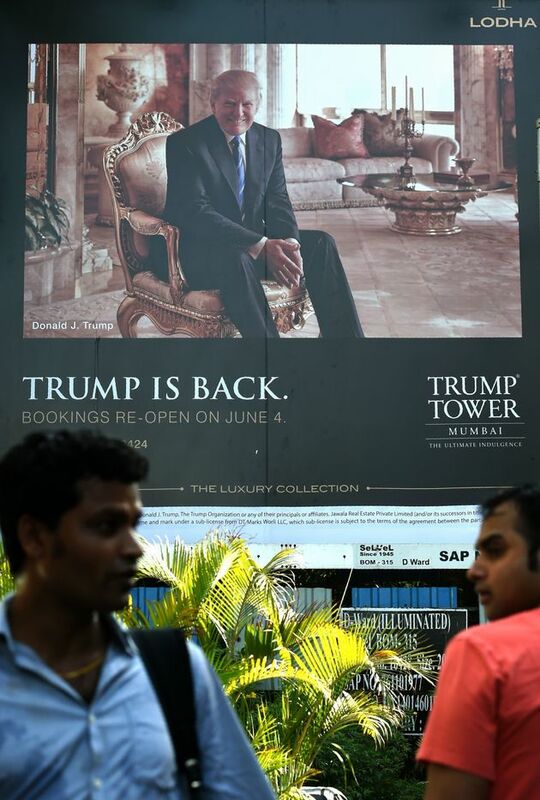 A billboard for the upcoming luxury residential apartment complex Trump Tower Mumbai. For these questions alone, Eisen, Tribe and Painter believe Trump needs to totally divest himself from his business, liquidate the assets and place the profit into a true blind trust governed by an independent trustee who is not one of his children. Federal ethics laws do not mandate this, but previous presidents have acted as though it does. The Office of Government Ethics issued a memorandum in 1983 stating that presidents should act as though the laws apply to them. As for whether the Emoluments Clause can be adjudicated in any legal manner, the only recourse appears to be the extreme action of impeachment. That is why the suggestion to liquidate Trump’s assets and place the profits in a blind trust may be an extremely onerous move, but, the experts believe, would be essential to maintain the integrity of national sovereignty that the Constitution demands. So far, Trump has said that he will hand his business over to his three adult children, Ivanka, Donald Jr. and Eric Trump. He has also appointed them to the executive committee of his presidential transition, negating any separation between government and corporation. On Wednesday he tweeted that he would announce a full plan for his transferal of the business to his children on Dec. 15. The simple temporary transfer of the business from the president-elect to his children during his term in office does little to assuage concerns about the potential for conflicts of interest or even the Emoluments Clause.